In an article entitled 'The Noratlas of Albert' in an August 2004 issue of a magazine, a trip was described to Albert in France to visit the museum there, using the Ryanair service from Dublin to Charleroi. The point was made that the many new and inexpensive airline services were ideal for the aviation enthusiast, enabling travel to many attractions in the UK and on the Continent. Ryanair now have flights from Dublin to Eindhoven in Holland, where there is just such an attraction which is well worth visiting. It is located three kilometres from the town of Best, which is itself ten kilometres north of Eindhoven. The attraction is the Wings of Liberation Museum Park and its two Douglas C-47s. The museum is located in an area where in September 1944 units of the US Army’s 101st Airborne Division landed as part of 'Operation Market Garden', the liberation of the Netherlands, which is what the museum celebrates. USAAF C-47s played a central role in that Operation, which is why the museum has two as exhibits. There are also some other aircraft, including a former Royal Netherlands Air Force Starfighter, a former Hungarian Air Force MIG-21, a Piper Cub and a Waco CG-4A, a troop-carrying glider of a type also much used in Operation Market Garden. Best is some sixty kilometres south of Arnhem and no doubt readers will be familiar with the film 'A Bridge Too Far', which graphically portrayed the difficulties which beset the liberation of the Netherlands. The museum also houses many documents, photographs, audio visual exhibits, memorabilia and such like which deal with this history. Its website is www.wingsofliberation.nl which gives much further information on the museum and contains photographs of its star exhibits, the pair of C-47s, sitting side by side, both painted in the USAAF marks of the period. However, neither carries the actual Air Force tail number it was originally allocated, nor did either of these aircraft actually take part in wartime operations in Europe. The history of any C-47 is usually a fascinating subject, as is the case with the museum’s exhibits. The first aircraft the museum acquired is c/n 4978, delivered to the USAAF in July 1942 (as a C-53C Skytrooper ¬Webmaster/RL). In 1945 it was sold to Continental Airlines as NC33315 (converted to DC-3) and would fly for this carrier for the next thirteen years. Interestingly on 9th September 1956 it was involved in a mid-air collision with a Cessna 170 over Bartlesville, Oklahoma but both aircraft managed to land without injury to the occupants. In 1958 the aircraft was sold to Southern Airways, with whom it would serve until 1967. There followed several operators for short periods. In 1975 it was acquired by Marian Air Services, based at Savannah, Georgia and registered N32MS, the registration it would retain for the rest of its career. It was one of four C-47 variants operated by Marian as mosquito sprayers and remained in service with Marian until 1987. There then followed a number of different operators over the years, including Air America Freight of McAllen, Texas. It was from here that the C-53C was purchased in the summer of 1996 by a Mr.Driessen of Holland, the founder of the Wings of Liberation Museum. N32MS was flown to Mesa, Arizona where it was prepared for its ferry flight to Holland – the first time it would ever visit Europe. It departed Mesa on 22 June 1997, routing to Salina, Kansas-Buffalo, New York-Bangor, Maine-Goose Bay-Narssarsuaq, Greenland-Reykjavik, Iceland-Wick, Scotland and arrived at Welschap near Eindhoven on 04July1997. (Bob Reid wrote me in Nov.2017: "The actual route was changed by me, I don't know who made the original route as shown on the little map.. Actual route was Mesa, Salinas,Toledo, Buffalo, Bangor, Goose Bay, Narssarsuaq, Reykjavik, Wick, Texel (nightstop), Eindhoven, Gilze-Rijen Air Base. We followed a yellow Beech D17 Staggerwing). It was based for a time at Soesterberg Air Base and the intention was to keep it airworthy. The following year however it was damaged after a serious engine fire. It was then dismantled and moved by barge and road to the museum location, where it was re-assembled, but its flying days are over. If the museum’s first C-47/C-53 did not have any European connections until its arrival in 1997, the same could not be said of the second aircraft, which has been based in Europe throughout its career. 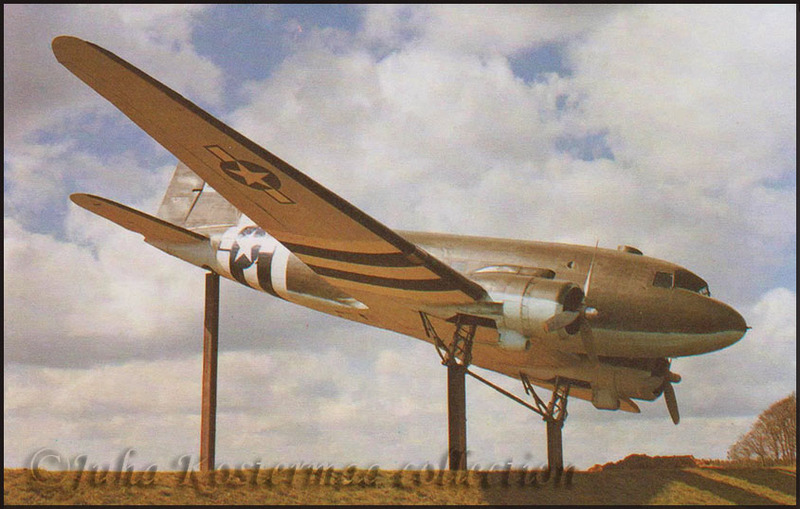 The C-47B-30-DK, c/n 33119, was delivered to the USAAF as 44-76787 in April 1945 and flown to Europe, where it was transferred to the French Air Force, serving for a few months with GT2/15. In August 1945 it was transferred to Air France, with a total of 157 hours on the airframe, and registered F-BAIF. Having been converted to a civilian passenger airliner, it entered service with Air France in April 1946 and would fly as part of its passenger fleet for the next 13 years. In August 1959 it was transferred to the Aeropostale de Nuit division of Air France and for the next ten years would fly the night mail throughout France. It was withdrawn from use in April 1969, its total airframe hours by that stage having increased to 25,731. F-BAIF was one of a number of Aeropostale C-47s, withdrawn from use during 1969, and was one of five of these aircraft sold to a company called Fret Air in October 1969. This company intended to become operational as a cargo airline, but this never happened, and in the event most of these aircraft remained parked at Le Bourget until they were sold to Uni Air of Toulouse, including F-BAIF. Uni Air had been formed in 1969, based at Toulouse-Blagnac Airport but also with a base in Paris. It operated general aviation type aircraft such as Beech Barons for charter from Toulouse and a Lear Jet based in Paris. In 1972 it decided to get into passenger and freight charters with the acquisition of the C-47s from Fret Air. During the 1970s, seven C-47s were registered to the company although some had only been acquired for spares use. Uni Air also had plans to get into larger freighter aircraft and during 1974 had two former Canadian military Yukons on order although in the event this acquisition did not proceed. The company did acquire a Carvair F-BYCL which was registered to Uni Air from June 1977 to August 1979, although it remained parked at Toulouse and never became operational and was sold. Nevertheless, Uni Air was active from 1972 onwards with its C-47 fleet, including F-BAIF, which was used for freight around Europe and to North Africa. A photograph of the aircraft appears on the website www.airliners.net on a bleak, wet and wind-swept ramp at Leeds/Bradford in April 1973, still in basic Air France colour scheme but with a ‘UA’ logo. F-BAIF came to visit us here in Dublin on 20th December 1973, from Dinard to Le Bourget. There is another photograph of it on the airliners.net website taken at Prestwick in May 1976, by which time it had adopted a yellow cheatline edged in red. Other C-47s registered to Uni Air during the 1970s were F-BAXR, F-BCYD, F-BCYT, F-BCYV, F-BCYX and F-BEHF. The company also operated a number of executive jets during the 1970s, Lears and Corvettes, which visited Dublin occasionally. By 1979 the era of the C-47 with Uni Air had come to an end, their aircraft either sold off or withdrawn from use. They had been replaced with Fokker F-27 Friendships, mostly used on passenger charters, as were a few Fairchild F-27s and one FH-227. This use of the Friendship would continue until 1992, when the last of the aircraft were sold off. Toulouse being a centre of French rugby, the company was ideally placed for ‘French Match’ charters which over the years saw many of the F-27s visiting Dublin on such charters, examples being F-BYAP and F-BIUK in March 1985. Throughout the 1980s and early 1990s Uni Air also operated many executive jets, Lears, Corvettes, Falcon 20, Citation, Hawker 125 which were based at Paris Le Bourget and many of these were Dublin visitors. They also flew Barons, Navajos, King Air, Beech Duke based at Toulouse. Operations continued until 1994 when Uni Air were taken over by another Le Bourget-based executive jet operation called Air Enterprise. The executive jet operation was amalgamated into Air Enterprise, based in Paris. The Toulouse base of Uni Air was thereafter known as Uni Air Enterprise but no longer operated any aircraft. It became an aircraft overhaul facility for general aviation aircraft and executive jets, and continues in this role today. To return to F-BAIF, it continued in operation with Uni Air until 1978 when it was withdrawn from use at Toulouse, where it remained for some years. It was acquired for a Belgian museum, known as the Victory Memorial Museum at Arlon and was painted in USAAF marks with the incorrect serial of ‘2100847’. It was mounted on a pole beside the highway leading from Belgium to Luxembourg and remained there after this museum closed down in 1998. It was acquired by the Wings of Liberation Museum and with the assistance of the Dutch Air Force was taken down from its pole and transported on a large lorry during the night of 25/26 February 2002 to the museum at Best where it is now on display beside their first aircraft. At one stage the museum at Best also had a third DC-3, this being the former G-AMPP of Dan-Air. We retain fond memories of G-AMPP. During the late 1960s, Dan-Air operated a passenger service connecting Bristol and Cardiff with Liverpool and Newcastle, on which ‘MPP was usually employed, until replaced by a Nord 262 in 1970. It was always a pleasure to monitor the stately progress of this veteran transport as it plied the route up and down the Amber 25 Airway, as it was then known, an example from the editorial VHF logbook being on 26th March 1968 when, having passed Knighton, level at eight thousand feet, it was estimating Brecon at time 1958 en route to Cardiff, the satisfying rumble of its two Twin Wasp R-1830 engines to be heard during each transmission. It was not difficult to imagine the majestic spectacle it must have presented as it cruised serenely over the scenic expanse of the Welsh mountains. In any event, the loss of G-AMPP left the Wings of Liberation Museum (Bevrijdende Vleugels, in the Dutch language) with the two C-47s, formerly N32MS and F-BAIF, which are currently on display. It is all very well that these aircraft have been preserved for posterity, but there is something profoundly sad in seeing such aircraft, which once were so alive and vibrant and performing worthwhile tasks, now reduced to objects of curiosity for gaping tourists. For the writer, this is particularly so in relation to F-BAIF, as I had the privilege of experiencing a very typical cargo charter flight shortly after it entered service with Uni Air. The sight of the aircraft sitting at Best brought back memories of the experience. An uncle living in France was in the business of rearing chickens, many of which were exported as live, day-old chicks. Mostly these went to destinations in Africa by scheduled air cargo. On this occasion, in October 1972, he had a large load destined for Morocco. He combined with another exporter and together they had a load which would fill a DC-3, the costs of which showed significant savings over scheduled air freight. Accordingly Uni Air, who had already established a reputation in the export of live animals, were contracted for the flight from Toulouse to Casablanca. Travel by train from Paris to Toulouse on 11th October was a forgettable experience, except for the final few miles, as the train approached Toulouse and passed the airfield at Montaudran. Here, beside the railway line, dumped at the back of a hangar, was the fuselage of Afric Air DC-3 7T-VBC, quite an unexpected sighting! Afric Air were a short-lived Algerian carrier who had flown two DC-3s on charter work until they ceased trading and both were eventually scrapped at Montaudran. The airfield at Toulouse-Blagnac was at an interesting and early stage of the European collaboration in aviation matters. Production of the Caravelle was in its final stages and only four more aircraft would roll off the line between December 1972 and March 1973, the last four of a production run of 280. As it was, none were seen, the hangar doors remaining firmly shut. Nor was there any sign of the prototype Airbus A300, which would make its first flight later that month. The big news at Toulouse was of course the Concorde. The prototype F-WTSS had made its first flight in March 1969 and was at that stage still the only aircraft to have flown. The second aircraft would not make its first flight until January 1973. F-WTSS was still engaged in flight trials and although it did not fly that day, it could be seen through an open hangar door on the far side of the airfield from the passenger terminal. An indication of the collaborative effort could also be seen in the visiting aircraft, with Rolls Royce Argosy G-APRM on the ramp as well as the company’s HS125 G-ATPB, British Aerospace HS125 G-AVPE and Hansa jets D-CASU and D-CERA, all with personnel from other companies involved in these joints projects. Airliner services produced little of interest, only Caravelles of Air France, Air Inter and Iberia. Air France/Aeropostale de Nuit F-27 Friendship F-BSUM awaited its call to action that night, a role that the Air France DC-3s performed years before. There were some interesting commuter aircraft to be seen, including Beech 99s of Uni Air, TAT and Air Alpes and a Queen Air of Air Perigord. The many towns in this southern region of France supported an active commuter scene, feeding traffic into the larger cities such as Toulouse. Although the main French Air Force base at Toulouse was then and still is at Francazal, on the other side of the city, then the base of CIET-340, the heavy transport operational conversion unit with its fleet of Nord Noratlas (frequent visitors to Dublin over the years on training flights), two of the unit’s Noratlas were at Blagnac that day, along with a visiting Paris and a Breguet 941. There was also a small Air Force unit based at Blagnac at the time flying the Nord Norecrin, five of which were noted. Dumped in the middle of the airfield was F-BAZJ, one of the L749 Constellations which had been used in the SAR role. I made my way to the Uni Air hangar and offices, and was shown around. On the ramp outside the hangar was F-BAIF, which was to operate the charter that night. It was still in full Air France colours but without titles. Also on the ramp was C-47 F-BEHF which Uni Air had acquired from Fret Air. It too was still in Air France colours but had been acquired to be parted out for spares, and would never be operated by Uni Air. Other Uni Air aircraft noted in and around the hangar were a Cessna 172 and 182, a Baron and an Aero Commander. Even at that early stage in the company’s existence, Uni Air performed third party maintenance work. Inside the hangar were two ex French military Broussards being worked on and outside the hangar lay two T-6 Harvards awaiting attention. Departure of the charter was set for 10pm that evening, so I arranged to return and went back to the terminal building where there was a balcony from which to monitor the activity. Darkness fell, but there was in the terminal a good restaurant for supper, which also had commanding views out over the airfield. There was little activity on the airfield at that hour of the evening, but the arrivals board did promise the landing of a Pyrenair scheduled flight from Pau at 8.30pm. On time, the lights of the arriving flight could be seen as the aircraft made its approach, and as it taxied past the Concorde hangar, which was still fully open with all lights on, the classic silhouette of a Beech 18 could be seen, an interesting mix of the old and the new. The aircraft was identified as F-BHMM of Pyrenair as it came to a stop on the ramp in front of the terminal and disembarked its passengers. By 9.30pm I had walked back to the Uni Air hangar to find that my uncle’s cargo had already arrived and been loaded onto F-BAIF. These day-old chicks are put into a special type of strengthened cardboard box, with breathing holes. The cargo is very lightweight, filling the aircraft with its bulk long before weight becomes an issue. The boxes completely filled one side of the cabin, awaiting the arrival of the other shipper’s consignment to complete the load. However, there was no sign of this other consignment, nor any phone call advising when it might arrive. The scheduled departure time of 10pm came and went, but still no word of the missing cargo. There was a room with some beds in it beside the main office, presumably to cater for situations such as this, so the pilot and co-pilot retired to get some sleep. The captain was a relatively youthful type, who also flew the company Lear Jet. The co-pilot was older, with combat experience with the French Air Force in Algeria, and definitely looked like some-one not to be trifled with! The third crew member, a combination of load master and administrative person who rejoiced in the title of ‘chef commerciale du voyage’, busied himself reading a newspaper. Not knowing what else to do, I just sat there and waited, wondering if French cargo charters were usually conducted in such a manner. He muttered darkly about the difficulties of finding the place and having got lost several times. The crew were roused from their slumbers and we walked out to the aircraft. It was at this stage freezing cold, but we all helped to load the cargo and soon the fuselage was completely full with boxes of chicks, ready for export to Morocco. The only other activity on the ramp at Blagnac at that late hour was a Europe Aero Service Vanguard which had arrived and which was being turned around for departure, its welcoming cabin lights and surrounding activity providing some company on the otherwise dark ramp. With the cargo loaded and doors closed, F-BAIF’s engines rumbled into life, providing some much appreciated heat. A jump seat, located behind the second pilot, slid out on rails until it was directly behind the throttle console, providing an excellent seat for the passenger, me. The Chef Commerciale du Voyage had his own station behind the captain and busied himself with the important task of unloading the large supply of catering he had brought along. This included wine for himself, although I was relieved to note that the flying crew would have to make do with coffee. ATC clearance was given to the Casablanca-Nouasser Airport, and at about one thirty in the morning, full power was brought up on the two Twin Wasps, accompanied by the glorious roar of a ‘Dak’ take off. We were soon climbing steadily over the lights of the sleeping city, setting course to the south-west. After the uncertainties of the past few hours, the freezing cold and other hardships, the cockpit of the Dak had become an extremely comfortable place as at last the flight could be enjoyed, made all the better when the Chef Commerciale produced his feast. F-BAIF levelled off at nine thousand feet, maintaining 130 knots in the cruise. Having crossed the Pyrenees, onward routing was over Zaragoza, Madrid and Seville, crossing the southern Spanish coast at Vejer de la Frontera, across the Strait of Gibraltar, overhead Tangier, Airway Red 10 to over Rabat direct Casablanca. The flying distance from Toulouse to Casablanca is 856 miles, the flight taking 6 hours. Nearly all of the flight had been conducted in darkness, except for the last half hour as it began to get light. Although Casablanca is on the coast, the flight routed somewhat inland to approach Casablanca from the east, landing towards the sea. It was a cloudy morning, giving the desert sands a grey look. By the time we landed it was raining heavily. The cargo was unloaded and the crew had the rest of the day off. The airport at Casablanca was then called Nouasser field (since re-named Mohamed V), but there was little of note to be seen; only Boeing 727s of Air France and Royal Air Maroc and a Tupolev Tu-134 of Balkan. A Senegalese Aero Commander 6V-ABE landed, providing at least one visitor of interest. The rest of the day was spent seeing the sights of Casablanca, such as they were, and partaking of the local delicacies, an indulgence that would later exact a heavy toll. Unfortunately I was unaware that there was a second airfield at Casablanca, called Anfa, where the Royal Air Maroc L749 Constellation CN-CCN was stored (it is still there to this day, clearly visible on Google Earth) which is where I should have spent my time! Having overnighted at Casablanca, we took off early the following morning, a bright sunny day. Uni Air had lined up a second charter. The plan was that the DC-3 would position empty to San Sebastian on the northern coast of Spain, where there would be a crew change. The company was to send its Cessna 182 from Toulouse to San Sebastian with a new crew, and we would return to Toulouse in the Cessna. The new crew would then take F-BAIF to Dinard, where it was to be fitted with a special water tank in the cabin, and it would then fly a live dolphin from Dinard to Ajaccio on the Mediterranean island of Corsica. Unlike the previous day’s flight when it was dark, this morning’s flight in a cloudless sky produced fine views of Morocco and the Spanish countryside. It was also pleasant to spend time in the now empty cargo compartment, with excellent views of the engines at work. The initial routing re-traced the previous day’s track, over Rabat, Tangier and Seville towards Madrid. Being daytime, the radio frequencies were much busier and as we approached Madrid a USAF C-130 Hercules came on frequency, making its approach to the Air Base at Torrejon and could be seen crossing our path at a lower altitude. From there the Red 10 airway led directly north to San Sebastian, a most picturesque city in the Basque region, on the Bay of Biscay coast. A distance of 757 miles, the flight took just under five and half hours. As we descended, a Spantax DC-7C passed close by opposite direction, climbing out of San Sebastian, a majestic sight! The airfield at San Sebastian is very much downtown, the runway on a spit of land in the bay, right beside the town. This makes for a spectacular approach over the bay, and we landed at 2pm on runway 22. This evidently was siesta time and there was quite literally no-one to be seen at the airport. While the crew went off to investigate, there was time to take a look around the general aviation hangar and ramp. Here were to be found a visiting British Cherokee, some locally based Cessnas and Pipers and a Tiger Moth. Of most interest were two Spanish-built types, AISA I-11B Peque, 1950-s vintage, two seat, single-engined aircraft resembling the Jodel, certainly not a very well known type. The crew eventually managed to find someone in the terminal building who was not asleep, and to ascertain that the Dinard charter had fallen through and that we were to return directly to Toulouse. F-BAIF was soon airborne again, flying to the north over the Bay of Biscay, skirting the Pyrenees and then heading direct track to Toulouse, where we landed after a flight of one hour twenty minutes. It certainly had been an excellent example of a typical cargo charter for this hard working veteran and a pleasure to experience the C-47 in action. As noted earlier, sadly F-BAIF’s career is now over and all that remain of its flying days are memories such as these. See my update on Photos by Friends & Guests, Page 47 on F-BAIF's final ending and fate.